My whole life, I've gotten to the doctor's office at least 10 minutes early. It's something that I’ve never questioned, like the sun rising in the east, or breathing, or somewhat less poetically, going to the doctor's at all. I've never wondered why; it was just the way things were. Yet despite my best efforts to arrive early, I am consistently forced to wait long after my scheduled appointment time before I am honored with the doctor's presence. Timeliness, which is an absolute expectation in most other professions, just doesn’t seem to be the standard in healthcare. The question is: why not? In a time bursting with innovative solutions to longstanding problems in healthcare, why haven’t we solved the universal struggle of the waiting room? If we can track our taxi or our pizza in real time, for example, why can't we get similar updates on when our appointment will be or notify patients of delays in real time? This may seem like too much to expect from the U.S. healthcare system, which struggles to address fundamental disparities in care and access far more egregious than merely waiting for the doctor. Yet the fact of the matter is that wait times matter. 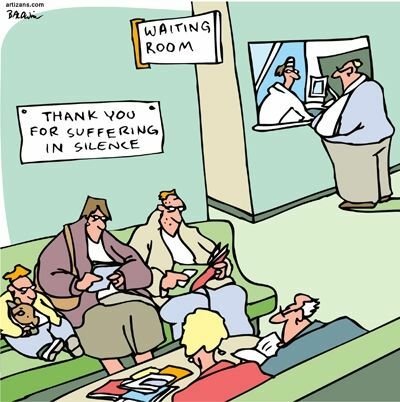 Patients are often at their most vulnerable in the waiting room, inundated with fear and uncertainty. Rather than receiving the care they need, they are forced to endure unacceptably long waiting times. They deserve far better than waiting an average of 23 minutes to see their doctor. This is not only an issue of unnecessary human suffering. Pragmatically speaking, the amount of time that people spend waiting for their care is a preposterous waste of human capital and productivity. I'm a huge proponent of big data and applicable mathematics, so bear with me as we crunch some numbers. In 2012, there were some 826,000 active physicians in the United States. Additionally, one 2012 study reported that the average patient panel size for a primary care physician was 2184 patients seen over the course of 18 months. Let's assume that each of these patients is experiencing the unjustifiable average national wait time of 23 minutes. That means over the course of just 18 months, over 50,000 minutes of precious time were wasted. That amounts to over 23 days (or 6% of the full year) of the patients' time wasted in 2012 alone. When you consider how difficult it can be for patients to juggle professional, family, and personal visits to see their doctor, that’s just absurd. Of course, this analyzed the total patient time wasted by a single primary care physician, not the 23 minutes that each individual suffered through. Perhaps this is less horrifying when spread over a full year and over 2000 patients. Why get worked up when each patient is individually losing less than an hour a year? Is this loss of time significant? It turns out, yes. According to a study by some up-and-coming medical school called Harvard, "the typical visit to a doctor consumes 121 minutes of the patient’s time — 37 minutes in travel, 64 minutes waiting for care or filling out forms, and only 20 minutes face to face with the physician." Leaving aside the time actually seeing their doctor, patients waste not just the average waiting time of 23 minutes, but closer to 100 minutes when travel and medical forms are taken into account. When applied to the average sum that a person could earn from working during that time, this amounts to $43 in lost time per medical visit. 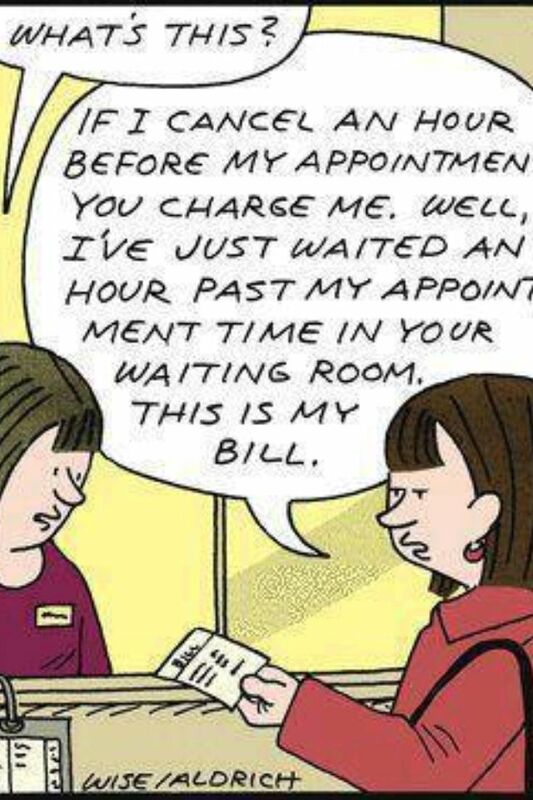 Considering that the average out-of-pocket cost for a visit is $32, this means that patients are losing more money out of pocket waiting for their care than actually receiving care. This study also gives us some new numbers to crunch. Assuming that a primary care physician sees 2,184 patients every 18 months and each patient loses around 101 minutes from each visit, over 100 days of patient time are being wasted in a single year. That's over a quarter of a year gone. We've discussed lost time, but how do these waiting times affect patients economically? This is a simpler calculation: if each visit costs the patient $43 in opportunity cost (the money they could have made working during this time), and there were 2,184 patients in 18 months, then over $60,000 of potential patient money is being lost a year. By a single primary care physician. This, of course, begs the question: how do these data appear across the entire spectrum of the United States healthcare? Since our average patient panel size is drawn solely from primary care, let's limit our scope to that specialty. We find that "in 2010, there were approximately 209,000 practicing primary care physicians in the U.S." . What do our numbers say now? Patient time wasted across the U.S. waiting to meet a primary care physician: 1,336.195 years. Total patient time wasted including travel time and medical forms: 58,475.464 years. Total patient money wasted across the U.S.: $13,085,072,000 per year. In this era of healthcare transformation, how can we use this lost time to help increase patient access and improve outcomes? Decades of productivity and billions of dollars are potentially being flushed down the drain every year. We must face the reality that we are harming our patients and placing unnecessary strain on our healthcare system. It's past time we do something about it. Nishad Rahman is a medical student in the Sidney Kimmel Medical College Class of 2019. Using Average Wait Time For All Practicing Primary Care Physicians In The U.S. Using Average Total Wait Time For All Practicing Primary Care Physicians In The U.S.